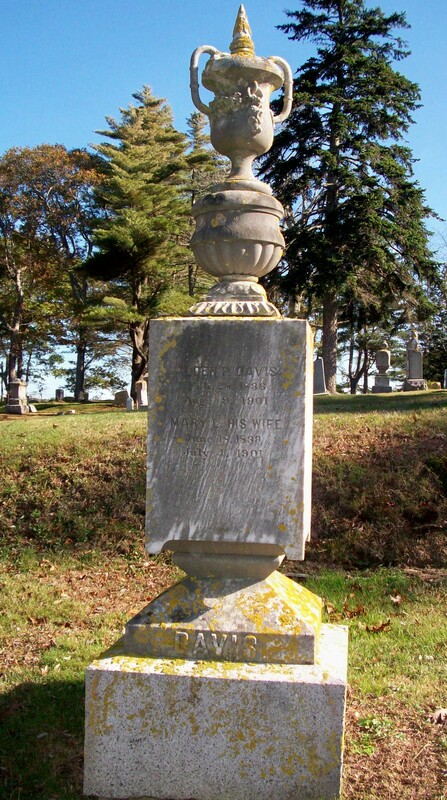 Born: February 28, 1836 in Derry N.H.
Died: August 9, 1901 in Bourne Ma. at 65 yrs, 4 mos, 12 d.; Alden was murdered by the family nurse Jane Toppan. Where Lived: New Hampshire; Somerville Ma. ; moved to Cataumet in 1873; lived at 19 Mystery Lane in Cataumet Ma. Married: November 24, 1859 in Bradford Vt.
1. Mary/Minnie Eliza Davis Gibbs; (August 18, 1862 – August 13, 1901); Married Irving Foster Gibbs, Capt. (1862 – 1933) (Paul Crowell Gibbs, Capt. & Maria Elizabeth Barlow) in Chicago Il. on July 5, 1888; Mary/Minnie was murdered by nurse Jane Toppan; Irving married (2) Beulah Alice (Davis) Jacobs (1871 – 1939) (Charles L. Davis & Caroline A. Lane) in New Bedford Ma. on July 2, 1906; Beulah married (1) Adelbert Eugene Jacobs (1864 – 1899) (John Haskell Jacobs & Julia Welch/Tracy) in Somerville Ma. on October 31, 1893; Mary/Minnie, Irving & Beulah are buried in Cataumet Cemetery. 2. 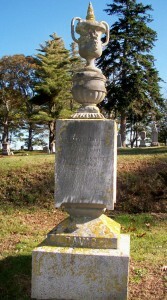 Henry Alden Davis; (November 13, 1867 – May 17, 1883); Henry died at 14 yrs, 6 mos. & is buried in Cataumet Cemetery. 3. Bessie Laurietta Davis; (July 3, 1869 – June 3, 1883); Bessie died in Somerville Ma. at 13 yrs. & is buried in Cataumet Cemetery. 4. Anna Genevieve Davis Gordon; (1871 – July 31, 1901); Married Harry Gordon (1866 – 1931) (George Augustus Gordon & Ann Farley (Gordon)) in Cataumet Ma. on October 4, 1893; Harry married (2) Edith Belle Fisher (1871 – Aft.1940) (Joshua Franklin Fisher & Anna Woodward) on May 18, 1908; Harry & Edith lived in New Jersey; Anna was murdered by nurse Jane Toppan & is buried in Cataumet Cemetery. 5. Allie Davis; Allie is buried in Cataumet Cemetery.